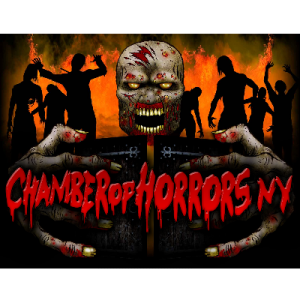 Chamber of Horrors NY is a Haunted Attraction located in Hauppauge, NY. Team Crypt Creepers reviewed this attraction on October 1, 2016. There may not be any crying in baseball, but when Matt Guiliano’s “Play Like a Pro” turns into Chamber of Horrors, you can be sure there’s gonna be some tears of fear. What normally is a baseball training camp becomes a trilogy of terror during the Halloween season. 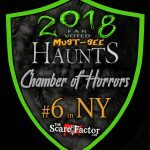 Three mini-themed haunts open up for one ticket price; on select nights, you can venture through the haunt with the lights off and just a glow stick to guide your way. That is what we did. To take a small break from the normal haunts, we took advantage of Chamber’s “Kill the Lights” night to experience terror in the dark. Not only do you go in with the lights off, but you go through backwards… double the madness! We reviewed the haunt for its “Kill the Lights” night, so be aware of that as you read this review. The cast here all have a lot of energy in them and they use it to really scare their guests. Some of whom go bending backwards, literally, to get a scream from their prey. They are interactive with their new friends and, if they learn your name, you’d better be prepared for some personalized torture. A good portion of the dialogue is scripted to the rooms, but that doesn’t make it any less creepy. Each character definitely fulfills their role, whether it be a decoy, a scare or a surprisingly-realistic animatronic that you can’t help but watch as it just sits and spins slowly, distracting you and making you get lost in… wait, where was I? The makeup here is very uniform among the actors; faces were painted in black and white to blend into the darkness of the theme for the night and no two faces alike. All were very complete, with no empty or missing spots. Each makeup job was like its own special, crazy snowflake. Where the makeup wasn’t used, there was usually the mask of a well-known movie maniac and each looked very much like the real deal. There was also the occasional bloody makeup job, but I’m sure there are a lot more of those on the normal nights… when the lights are on and you can really enjoy the gruesome details put into them. The staff here is extremely helpful and willing to assist their guests before the residents inside make all that help for naught by taking their lives. The queue is normally outside, but if there is rain, snow or, as their website publicizes, a “shower of toads,” then they have two indoor waiting rooms where they can fit up to 500 people to shield them from whatever plague descends from the sky. The red emergency exit curtains are noticeable, even in the dark, so it is easy to get out if there is a real emergency (or if you are just about to have an emergency in your pants). The haunt itself is located on a service road, right off the side of the L.I.E., so as long as you stay on the service road, you can’t miss the giant, gray face and hands waiting to take you in. During the rest of the year, Chamber of Horrors is actually home to a baseball training camp. Then, towards the end of the summer, the walls start going up and most of the area becomes the hell-house known as Chamber of Horrors. While most of the time you are peering around, looking for which side the next scare may come from, there is a chance you will catch a glimpse of sports equipment. It may take you out of the moment for a split second, but don’t let that deter you; the actors here are quick to pull your attention right back to them. There is even one spot where it is intentionally left open so roaming creeps can take full advantage of you letting your guard down. A feature I actually really enjoyed. This haunt uses a good mix of animatronics and home-grown sfx. They even admitted that they played around with a few fun ideas and “may” have had some appliance casualties. But, you can’t make an omelet without breaking a few skulls, right? I enjoy home-grown special effects because it gives someone like me, with no technical know-how and a tight budget, ideas to play with at my own home. (Note: DO NOT try at home. Possible dangers when not done by a professional. Try at a friend’s house instead.) But, don’t let my talk of the simple scares fool you, they have some great animatronics to either grab your attention or catch you when you least expect it. All of which will take you by surprise and cause at least one member of your group to think twice about assuming what is just part of the set… and what is more. Aside from the “Kill the Lights” theme, the haunt itself has three mini-themed sections. The first of which is a well-detailed manor of mayhem where the maniacs wait to massacre you. You go from den, to kitchen, to bathroom… all normal rooms within a home, and each room is presented in a very homely manner. You know, besides the bodies hanging from the ceiling, dripping blood. The second is a psychiatric ward where not all the patients are 100% human anymore and, again, the details here all correspond to the feeling of being trapped in an asylum of torture and undead. The last is an homage to the people who gave us nightmares growing up… both fictional and very much real. All three themes are done very well in their own right, but the overall theme for the night was “Kill the Lights…” and trust me, they did just that. Not literally of course; light is inanimate and, therefore, cannot be killed, but you know what I’m getting at. This haunt uses a lot of misdirection and distractions to throw guests off their game. They do a good job at scaring the whole group… making sure that whoever is in the front or back aren’t the only ones getting a taste of fear. There are a number of different types of scares used, while the drop portrait is a steady favorite here. The length of this haunt is somewhere between 25-32 minutes, depending how fast you power-walk through it (remember, no running in the haunt!). They make very good use of the space allotted to them within the confines of this sports complex and, for the price of $25, you get a lot of varied rooms and some high-energy performers. 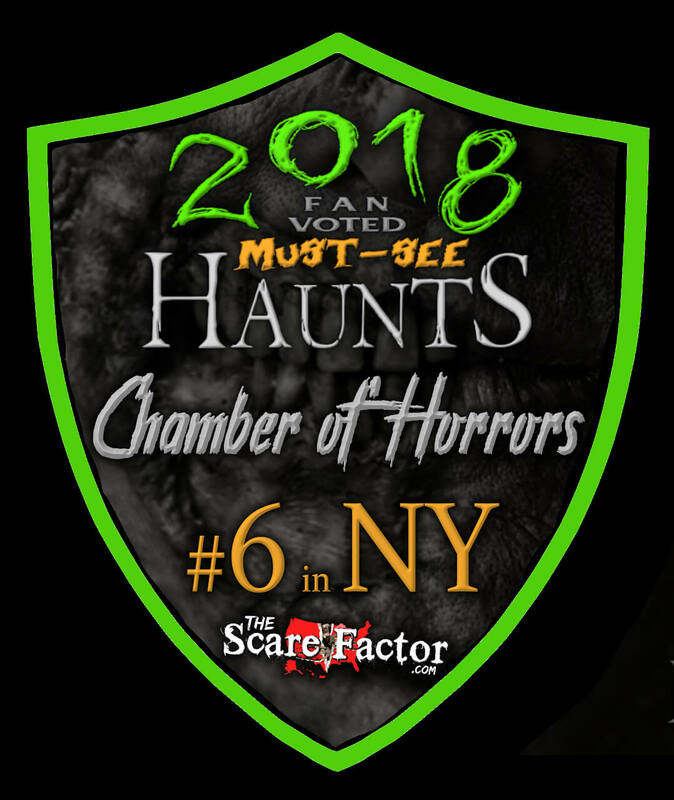 This is another of the ScreamLI.com haunts that have teamed up to offer guests the opportunity to buy tickets to 4 different haunted houses for $80. There are also other discounts available online, as well as R.I.P. passes to let guests skip the line and greatly reduce their wait time.